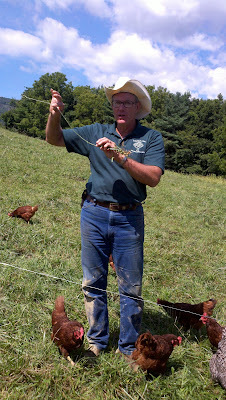 It's hard to think of any farmers more famous than Joel Salatin. The owner of Polyface Farm, Salatin has been featured in Michael Pollan's The Omnivore's Dilemma and in the documentary Food, Inc. He has written numerous books, lectures far and wide,* and happens to give weekly tours on his farm, one of which we attended two weeks ago. For those who aren't familiar with Polyface Farm, a little background: Joel Salatin describes himself as a "grass farmer". 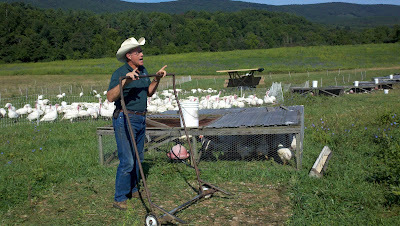 He pastures broilers, turkeys, layers, pigs and beef on his land, using intensive grazing methods. 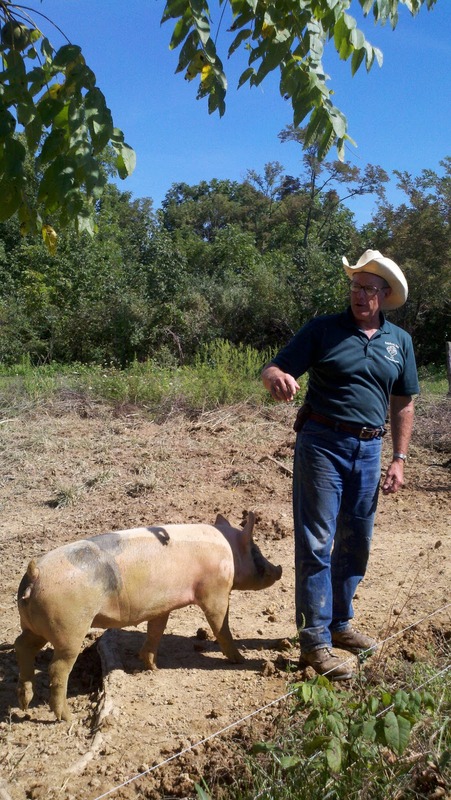 Salatin is not organic certified (see here), but he doesn't need to be. He's made a name for himself in the sustainable agriculture world. In fact, Salatin only sells directly to consumers at his farm, and to restaurants and buyers' clubs within a four hour driving distance of the farm. 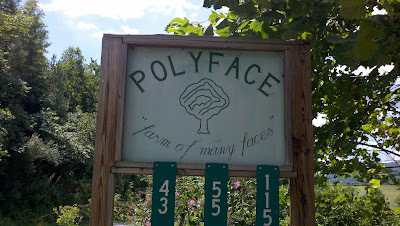 Tours at Polyface Farm are very well attended, if my experience was any indication. Everyone loads onto a couple trailers that have been comfortably padded with straw bales, which Mr. Salatin then trucks around the farm with his big ol' tractor. 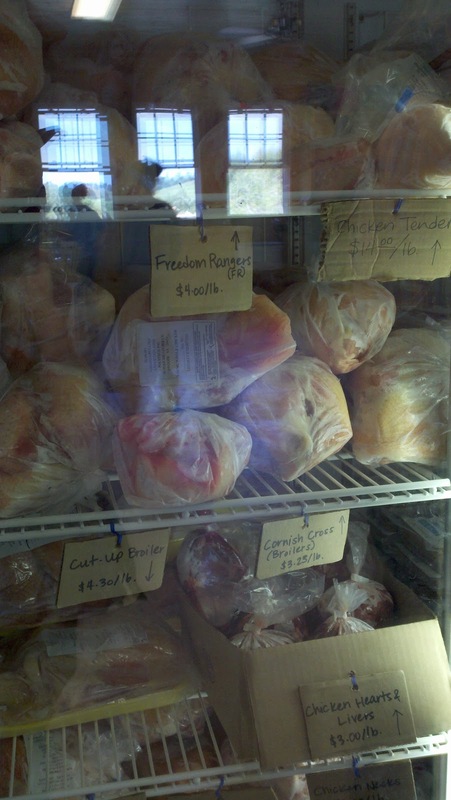 First stop: the broilers and the turkeys. The broilers, as you can see, are kept in separate pens that are about ten by ten feet. 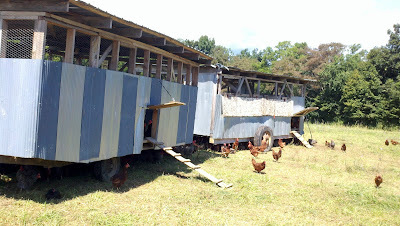 They are moved across the field to a new spot every day, giving the chickens new grass and new insects to feed, but without leaving them in one area long enough to kill the field with their "hot" (i.e. nitrogen-rich) poop. The turkeys are moved every two days. The pigs are kept in woods on Polyface's 550 total acres. They're moved about every two weeks, which is enough time to stir up the soil in the forested areas without killing the trees. According to Salatin, after being used as a pig run, this area will be far more lush and vibrant than if it hadn't been. 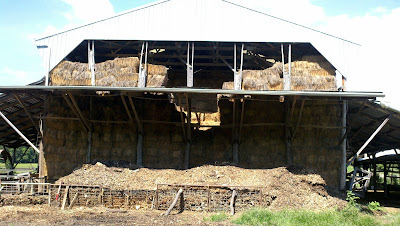 Salatin says they don't cut much hay...just what they need. Salatin's so-called "Egg Mobile", where his layers are housed. He follows them about two days behind the cows, so the chickens can go through the cow dung and pick out parasites and flies, mimicking the symbiotic relationships between birds and some migratory animals in nature. 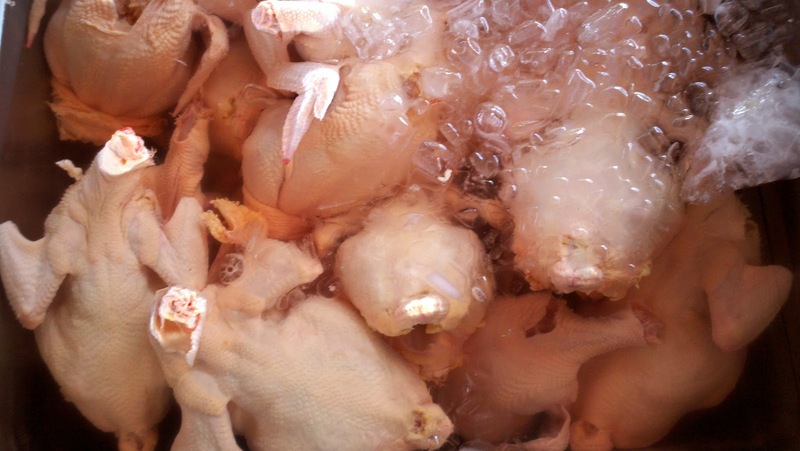 By scratching up the cow droppings, the chickens also spread it around, making it a more effective fertilizer, and fertilize the fields with their own leavings as well. The cows are moved every day. By grazing them within a smaller area, Salatin says they are forced to eat everything, not just pick and choose the nicest bits. 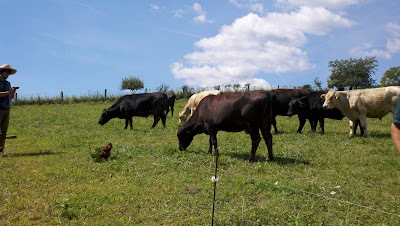 The cows are grass fed and, in winter, put on hay - they are never given a corn-based diet. If you've read or seen anything about Salatin, you know that he has a lot of stock phrases, and we got to hear them all. (If I were giving a tour a week and lecturing 100 days a year, I'd probably have some handy sound bytes too.) But despite that, he was certainly not merely reciting a memorized script. He was genuine and approachable, answering questions in detail, and no topic was off-limits. 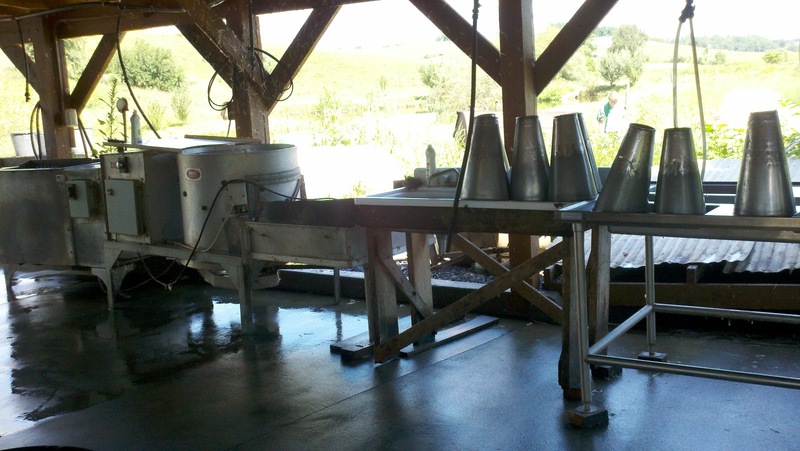 Although the tour ended after the cows, we took a few minutes to explore around the farm. This is Polyface's chicken processing area. Because it is open to the air, the USDA has tried to shut Salatin down numerous times, saying the area doesn't conform to USDA standards. Somehow - through the forcefulness of his personality, perhaps - Salatin has managed to keep them back. They process a lot of chickens. These chickens actually come from a satellite farm that grows and processes chickens for Polyface, and is run by a former intern. Our last stop was the gift shop, which features quite a bit of meat products, as well as t-shirts proclaiming things like "Lunatic Farmer" and "Everything I want to do is illegal." Nearly everyone on the tour came armed with large coolers, which they then stocked with Polyface Beef, Polyface Pork, and Polyface Chicken. We were no exception. 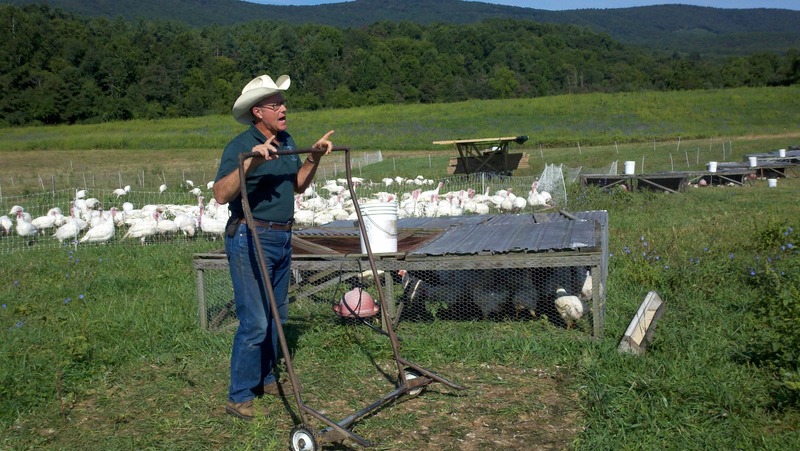 *Salatin will be a keynote speaker at this year's Acres U.S.A. conference, incidentally.